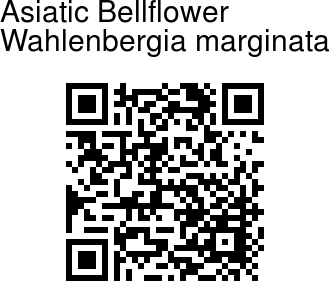 Asiatic Bellflower is a perennial herb with blue bell-shaped flowers. Roots are elongated, carrot-like. Stems are erect or ascending, 10-40 cm, branched at base, hairless or sparsely hairy below. Leaves are alternate, mostly on lower part of stem, lowermost sometimes caducous, stalkless or with stalk up to 7 mm. Leaves are spoon-shaped, inverted-lanceshaped, elliptic, or linear, 1-4 cm × 2-8 mm, hairless or sparsely hairy, margin sinuate, sparsely toothed or entire. Flower-stalks are erect, terminal and sometimes axillary, slender, up to 20 cm. Hypanthium is obovoid or conic, glabrous. Sepals are triangular or subulate. 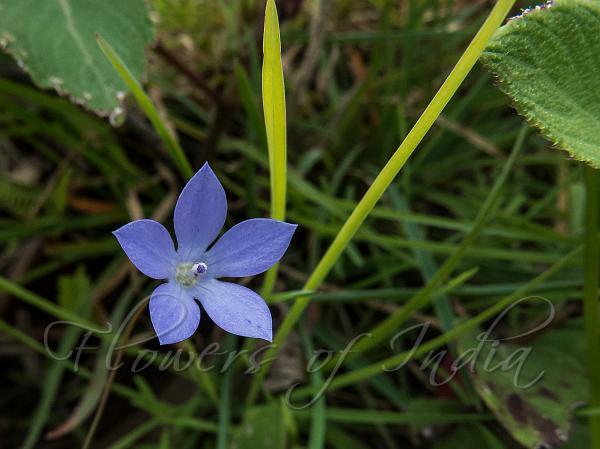 Flowers are blue, broadly bell-shaped, 3-12 mm, lobed to 1/3-2/3 the length. Petals are obovate, oblong, or narrowly oblong. Capsule is obconic, obovoid, or subglobose, 3-8 mm. Seeds are yellow-brown or dark brown, oblong or ellipsoid, slightly compressed, 0.3-0.5 mm, smooth. Asiatic Bellflower is found in subtropical Himalayas at altitudes of 600-1400 m, Western Ghats, east to China and S. Japan, Malaysia, Australia, New Zealand, at altitudes of 600-1400 m. Flowering: February-May. Identification credit: Satish Phadke, N.S. Dungriyal Photographed at Kodaikanal, TN & Ratanwadi, Maharashtra.